On Monday 16th October What On Earth? Publishing in association with the Natural History Museum release a fantastic new book in their Explorer Series. Explorer Dinosaurs! is more than simply a book, as it also contains a 1.8m long (6ft) Timeline Poster. 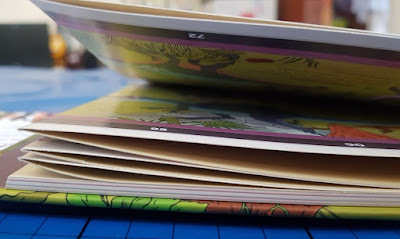 The Explorer Books are devised by Christopher Lloyd, with illustrations from Andy Forshaw. 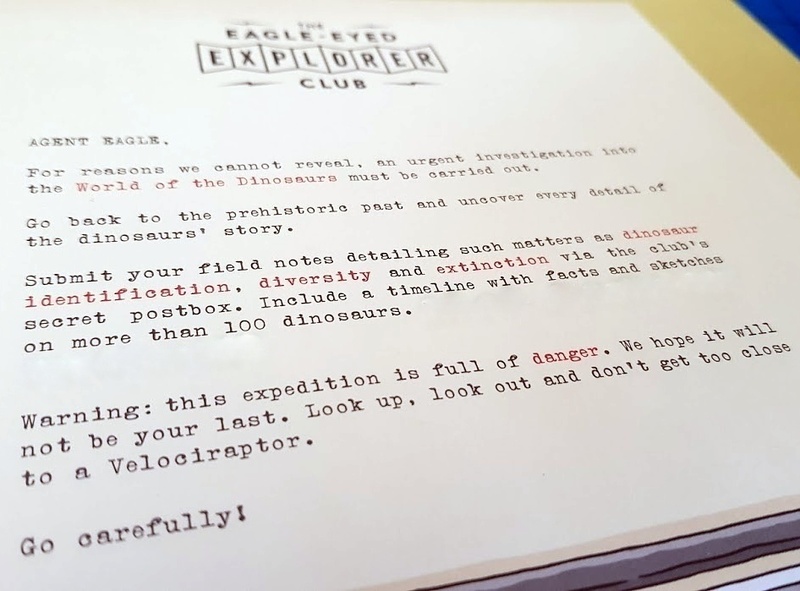 Readers can also join the Eagle-Eyed Explorer Club, completing special missions and challenges in order to win certificates and prizes. The first 100 successful agents to complete the Explorer Dinosaurs! mission will be presented with a fascinating Coprolite Fossil (petrified dinosaur poo!). Go to the Explorer Club Homepage to find out more. Explorer Dinosaurs! has 36 pages of text and illustrations split into relating the history of Palaeontology and the discovery of dinosaur fossils, how dinosaurs lived and survived, and how they died. It also has a section on which dinosaurs are still with us - you may be surprised! 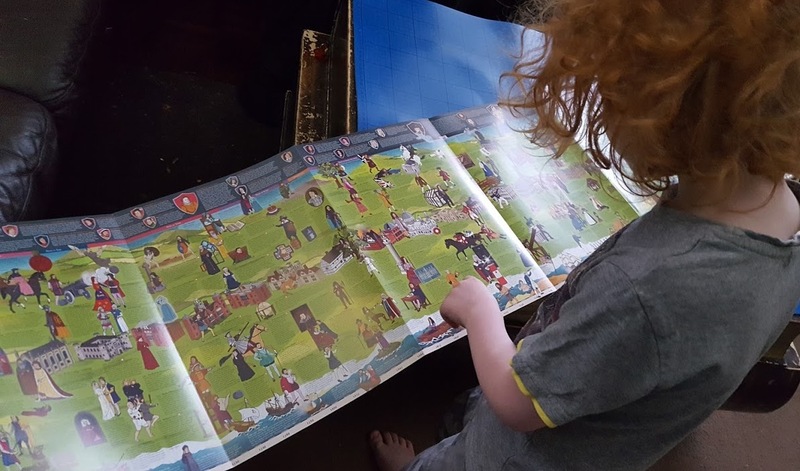 Towards the back of the book is a quiz (my boys loved this as much as I used to when I was their age) and right at the back is the Timeline itself. This is an 8 page spread pulling out to a 6ft long poster, which can be removed from the book and stuck to the wall. What On Earth? books are full of information, but using the timeline format and clear illustrations allows anyone to immediately have a better understanding of the different periods of history and where they actually slot into place. 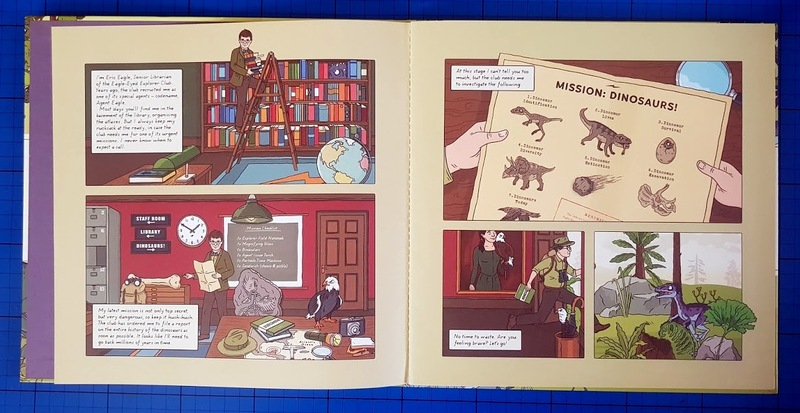 Because the books are written in associated with the Natural History Museum, you can be assured that the information included is to the best of current knowledge correct and up-to-date - even if it is 100 million years old! Explorer Dinosaurs! is a great book for children of all ages with an interest in dinosaurs, fossils or pre-history. 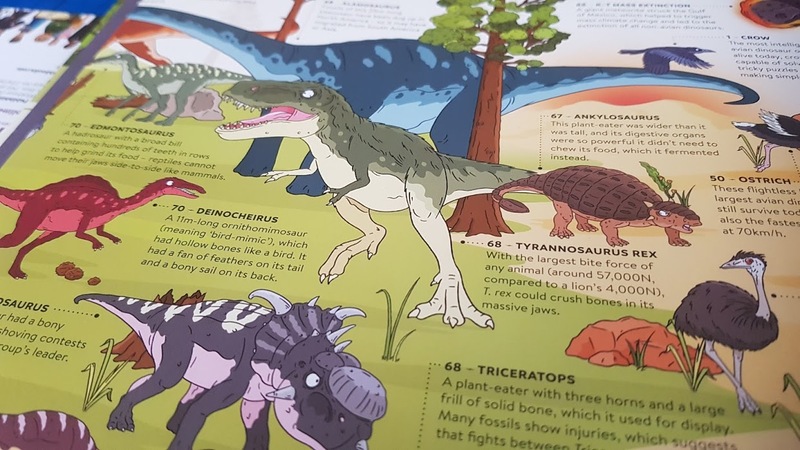 Younger children can read with an adult and take information from the illustrations, older children and adults are still fascinated by the text and the clear way you can see the evolution of the dinosaurs and life on Earth over the past 230 million years or so. 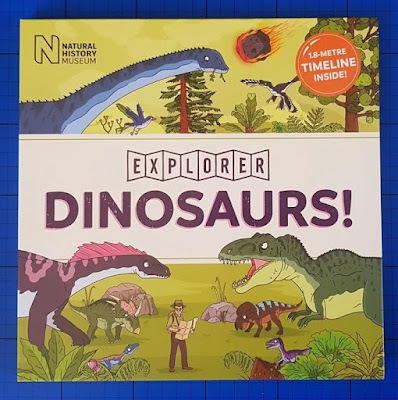 The Explorer Dinosaurs Timeline Wallbook is full colour, with a 36 page hardbacked book and a removable 8 page (1.8m/6ft) fold out wallbook. Available now for pre-order or from Monday priced £9.99. An excellent gift for any dinosaur fan. If dinosaurs aren't your thing, many other books are available containing posters and timelines. We have previously reviewed the What On Earth? Timeline Wallbook Of British History. What On Earth? 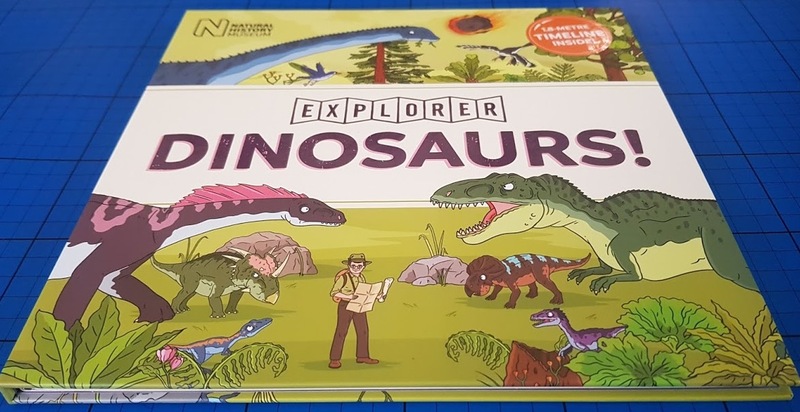 Publishing have offered a copy of the Explorer Dinosaurs Timeline Book for one of my readers. Entry to the giveaway is by Rafflecopter form below, open to UK entrants only and it will end at midnight Sunday 5th November. Full T's and C's at the bottom of the Rafflecopter form. What On Earth? would like to send all of my entrants a discount voucher - for this reason alone the first and only mandatory entry is to enter your email address. Your details will not be used for any other purpose and you will only get one email. 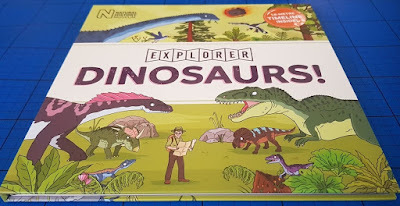 We were sent our copy of Explorer Dinosaurs! for review. I'd dress up as a cauliflower! I would find a good place to hide! Run away and hide as fast as possible!!! I would hang out with the vegetarian ones! I would hitch a ride on a friendly giant bird. I would be like a chameleon so I could hide from them! I would make friends with the Trex so he would protect me! I'd hang out with all the herbivores - they wouldn't find me very tasty! Bring my hubby he's much chunkier and far more appetising than me! Haha I love your comp questions!! I would make myself an armour out of tin foil - hopefully they'd see their reflection and run away scared of me (themselves)!! take some food with me to throw at them while i run! I'd find vegetarian dinosaurs and dress up as a cow so they wouldn't want to eat me! Be as high up as i can! Either find a cave or dig a hole underground to make a little home! I would wear a dinosaur suit so they would think I was one of them, all being a bit smaller! Wear my darkest pair of sunglasses, if I can't see them, they can't see me right?!! I would make myself a papier mache rock costume and sit very still when they look at me! Cover myself in dinosaur poo so they can't smell my human scent. Gotta do what ya gotta do! I would try and get to high ground where the larger dinosaurs couldn't get to! Keep as small as possible and find a safe place to hide! I would bath in that vile stuff that stops you from biting your nails but also prevents you from eating anything without cutlery (ie sandwiches and crisps) as it tastes disgusting. Id take some meat with me to throw and distract them then find somewhere to hide. I'd make sure I took my 7yo son wit me. He's a bit of a Dinosaur expert so he'd know how to survive. I'd take my hubby with me and throw him to the dinos instead! I'd run and hide away!! I would put Peppa Pig on Youtube and they would be mesmorised.